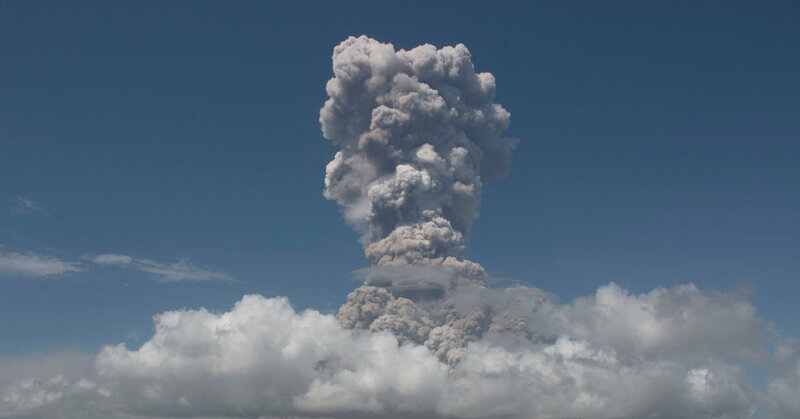 A billowing ash cloud rose above the Mayon volcano on Monday. The volcano is about 200 miles southeast of Manila in Albay Province. MANILA — Philippine officials raised the alert level on the Mayon volcano on Monday as it began spewing an ash plume more than 4,000 feet high from its summit in a spectacular show of destructive power. The Philippine Institute of Volcanology and Seismology has raised the alert level to four — the highest is five — meaning the cone-shaped volcano was in a stage of “intense unrest” that could set off a hazardous eruption at any time. The volcano generated up to 1,600 feet of lava fountains before dawn Monday, lighting up the dark sky with an intense crimson glow. At least two nearby villages experienced ash fall, the volcano institute said. “The lava fountains signified an increase in mass eruption rate, as lava was observed to be flowing more voluminously than before,” it said, adding that lava flows had spread more than two miles from the crater. More than 40,000 people have been directly affected by the eruption, about half of whom were staying in one of about 27 evacuation camps, while the rest were staying elsewhere, according to the National Disaster Risk Reduction and Management Council in Manila. With an elevation of 8,077 feet at its summit, Mayon, about 200 miles southeast of Manila in Albay Province, is the most active volcano in the archipelagic Philippines. It began spewing ash, rocks and mud on Jan. 13, and the eruption has been attracting hundreds of tourists to the region.